SORRY! LAST ONE SOLD ON 27 APRIL 2012. NOW AVAILABLE IN BLACK; WHITE; KHAKI; OR OLIVE! In the year 1535, an edict was initiated in Spain by the reigning monarchs. This cedula decreed that both Santo Domingo and Mexico City were now authorized to establish facilities at which to coin silver and copper. 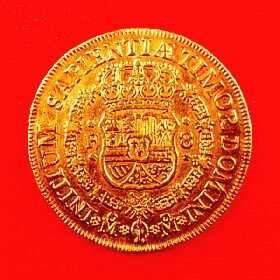 King Carlos I and Queen Regent Juana, in their very specific ordinance, detailed the appearance of the new coinage, as well as its weights, denominations, etc. 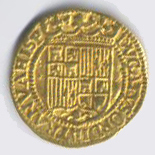 Part of this description was that the king’s motto: PLVS VLTRA (“More Beyond”) was to be displayed in a conspicuous place on each coin, as well as the Gothic M (Mexico), identifying all such output as originating from the mint in Nueva España. In 1536, the new mint in Mexico —established at the former hacienda of Hernán Cortés— was up and running and stamping out crude coins for colonial use and for the efficient shipment of precious metals to Spain. In 2006, we commemorated the 470th anniversary of the first issuance of any type of coins in the New World: those from the casa de moneda at Mexico City! 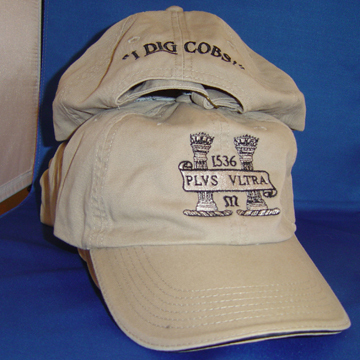 The PLVS VLTRA Cap was our "dedication" to this pioneer effort. 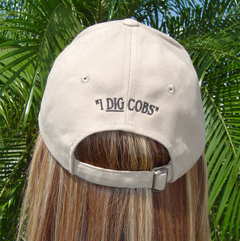 On the back of the Commemorative Cap, above the quick-adjust strap, are the half-inch-high words: “I DIG COBS!” … which only means something to us “inner circle” collectors, scholars, treasure divers, and beachcombers who do “dig” cob coins! I can envision coming down the aisle at a coin convention and being readily recognized as a collector of Spanish colonial coins just by the cap that I wear! I can also see the envy of others as I wear this striking cover while swinging my metal detector at the beach or protecting my nose from the sun aboard a salvage vessel off Florida’s Treasure Coast! 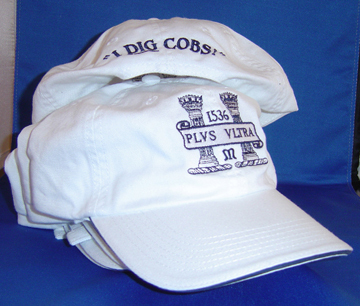 Requests for the ball caps offered in 2006 keep coming in. Thank you! 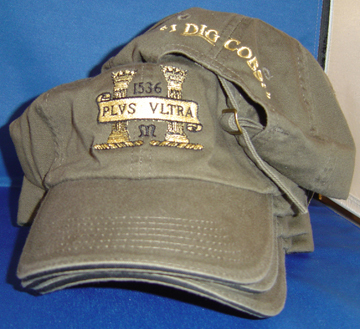 In light of the continuing interest in this item, we have authorized a small production of these PLVS VLTRA caps in new colors for this holiday season. This is to differentiate the new caps from the original issues … and to add variety to our sports wardrobe! 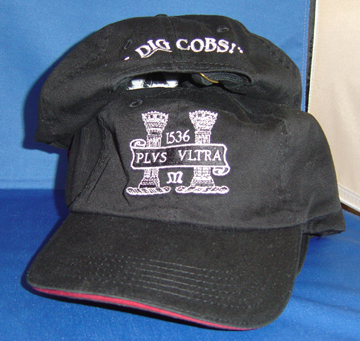 SPECIFICATIONS: Made of 100% washed cotton twill; embroidered logos; sandwiched, pre-formed brim; low-profile crown; one-size fits all adjustment strap. Promotional item, priced at minimal profit: $30.00 plus $5.00 postage in the U.S.
DUCAT. Spanish Netherlands (Kampen?). Three-Tower mint mark, top of obverse in legend. 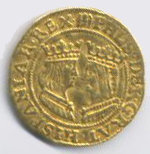 Felipe II ca. 1590. Obverse: Portraits (facing) commemorating the Catholic Sovereigns, Ferdinand and Isabella. Reverse: Crowned Hapsburg Shield. Weight: 3.4 grams. Major Diameter: 23.5 mm. Condition: Circulated, Extra Fine+. 454 Chevy engines the salvage boat has been able to excavate 6’ to 8’ deep in 20 feet of water in a matter of minutes. rather than the conventional 'under the boat' connection (possibly a first in the salvage community). Under rough weather emergency conditions this can be quite a time [and finger] saver. The Brownie Third Lung hookah rig, with twin Gast Compressors, can handle 4 divers on 100 feet of hose when long-lining a new dive site. to position the boat over salvage sites. and has a shower on board as well. Outfitted with double bunk beds in one stateroom, and bow bunk beds forward, the boat can handle overnight trips when needed." —Bob “Frogfoot” Weller and Rob Barfield, Treasure Divers and Former Owners of TREASURE QUEST MAGAZINE! Heavy-Duty Dive Ladder BOTTOM LINE: SORRY! SOLD! 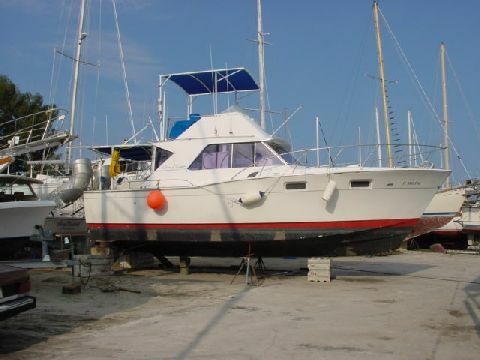 FULLY-RIGGED FOR WORKING THE COASTAL REEFS...YOU COULD BE ON-SITE THIS SEASON! 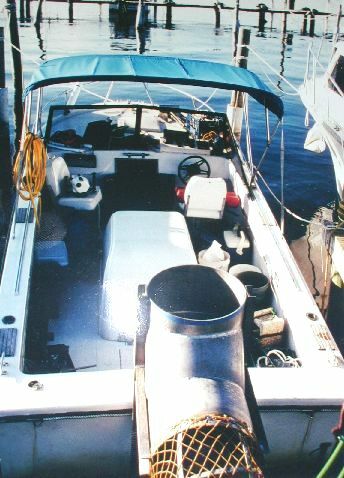 ENGINE: GM Mercruiser, 350 c.i. 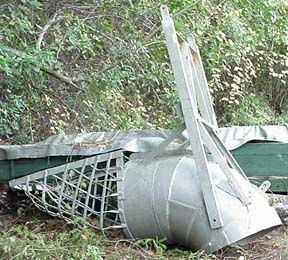 TRAILER: Boat Stored on ROCKET Trailer. Ready for the road! BLOWER: Custom-built, Heavy Gauge Aluminum Prop-wash Deflector with Safety CAGE. Stepped design for easy entry / exit from water. Easy to install or remove from boat. HOOKAH: Two Hose, HONDA-driven Surface-Supplied Air. Brand-new Carb. 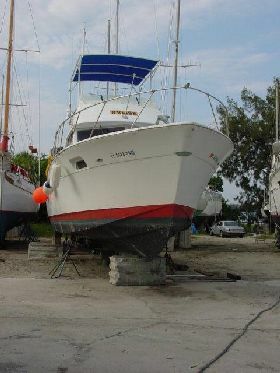 OUTFITTING: Three-way Anchor setup, all lines included. Foldable Dive Tank Racks. Outriggers. Teak Dive Platform. PORTRAIT GOLD COIN FOR SALE! In the halçyon days of salvaging the 1733 Spanish plate fleet in the Florida Keys, divers Jack Haskins and D. L. Chaney recovered, among other treasures, five gold coins of great rarity today on the San José! One of them (currently for sale) is pictured here and another in Bob Weller’s latest book, Galleon Alley, on page 153. The first issue of milled gold coins occurred from the Mexico City mint in 1732, and only a couple of these can be traced today. The five San José “Portrait Coins” are among an estimated ten of this 1733 issue to have survived to modern times. (Jack had previously recovered a 4-escudo “portrait” from the Angustias of 1733.) The “face” of this coin bears a bust of King Felipe V of Spain, and the reverse is emblazoned with a crowned and wreathed shield of Spain. 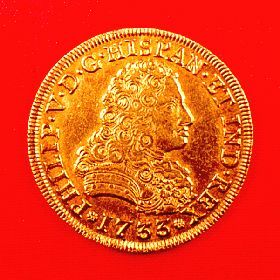 The mint mark (oM), the assayer initial (F), and denomination (8) [escudos] are noted on the reverse, while the date (1733) rests under the bust on the obverse. Here are TWO aluminum "dusters" (they have many nicknames) located on Florida's Treasure Coast. For 16" - 17" (MAX) propeller. Sound, all-aluminum construction. "We will advise the buyer how to mount this one as part of the deal. For a FEE, we will assist in the installation AT OUR FACILITY. This blower sold for $3000 new (installed), its price now is $1250, picked up at our shop in Sebastian, FL." Brackets and mods will be required to adapt to your boat. ONLY $1250, you pick it up here! For 21" - 22" (MAX) propeller. Sound, all-aluminum construction, for up to a 35-foot boat! 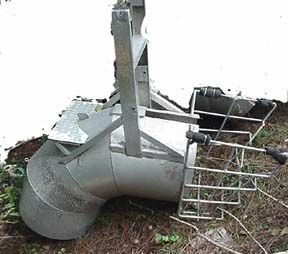 "We will advise the buyer how to mount this one as part of the deal, NO INSTALLATION OFFERED. For a FEE, we will travel within 30 miles to ADVISE on installation. 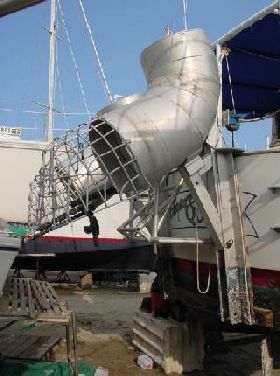 This blower would cost $3500 new, its price now is $2000, picked up at our shop in Sebastian, FL." Brackets and mods will be required to adapt to your boat. ONLY $2000, you pick it up here!